Litter box training. 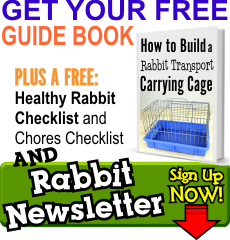 This has been a must for any house rabbit that I’ve owned (check out our how to guide for litter box training, it’s very simple to do). Your house rabbit will have occasional accidents but most will be avoided with proper litter box training. A space to call their own. Even though your rabbit will love having the run of the house its still important for them to have their own space to retreat to if they ever feel tired or scarred. This can be as elaborate as a big ol’ multi-level rabbit condo cage or simple as a box. Bunny proofing. Your home is full of things that your rabbit would love to (and will!) chew on. Cords need to be moved out of the way or out of reach and house plants should be moved re-positioned so that your adventurous bunny can’t munch on them (most house plants are VERY poisonous so don’t chance it – move the plant). 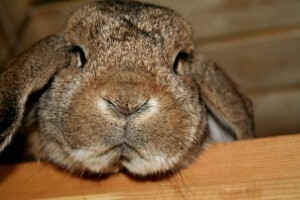 Wooden furniture and other household items can also become a bunny chew toy so keep a bottle of “anti-chew” spray around (like a bitter apple spray) to deter those teeth from eating up your house. Most rabbits are very happy to romp and play without being destructive but keep an eye on them just to be sure they’re not gnawing on great-grandma’s antique dining room table. 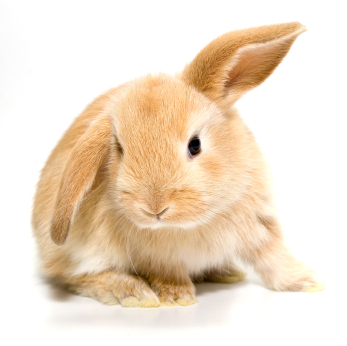 Making sure your rabbit is getting the right food is also an important part of keeping them from chewing, check out our page on rabbit feed and rabbit treats for more details.